The joys and hazards of buying at auction: Collecting Old Master paintings. Forming an old master collection need not necessarily be expensive and it is, happily, one of those investments activities where the pleasure and appreciation of the beauty of ones acquisition increases the longer you possess it. Concentrate your energies at the auction sale on evaluating the quality of the painting that takes your fancy rather than the name of the artist the painting is attributed to. You will be vindicated as your painting maintains it value from one generation to the next – a leitmotif that runs through Anthony Powell’s cycle of novels, ‘Dance to the Music of Time’. By concentrating heavily on the artistic quality of the painting rather than the signature you will often find yourself in the happy situation where subsequent art history research reveals a not previously known or even a lost work of art by an important old master. One of the most difficult things to learn when bidding on an Old Master is, what exactly am I buying? This might seem obvious; if the catalogue says, Rubens, then, if successful, I have acquired a painting by the 17th. Century Flemish master, Sir Pieter Paul Rubens. Or, maybe not. Maybe it is a forgery. Or maybe, I did not pay sufficient attention to the small print in the back pages of the catalogue. These pages fall into the category of the Legal Agreement, that accumulation of closely printed pages of microscopic-size type, written in legalese that most of us ignore and blissfully agree to when downloading software and click on the ‘I Accept’ button. Attribution is a minefield in which even experts can make mistakes or disagree with one another or, as they are perfectly entitled to do, change their opinions at a later date. Art scholarship is not an exact science and the art historian’s opinion may reasonably be influenced by who is paying the fee to acquire it. A rule of thumb is, where the painting is mentioned in the auction catalogue with the artists full family and first name, and his dates, even better, the date when the painting was created you are on reasonably safe ground. If the catalogue describes the painting as bearing the artists signature and, even better, that it is signed and dated by the artist, this is a bonus. In the case where the painting is described in the catalogue with simply the artists initials and family name or, even, his or her surname only, the attribution is doubtful. The catalogue may also describe the painting as having a signature; this is a red light, indicating the authenticity of the signature is in doubt. Don’t even ask me about paintings described as being, (say) after Rubens, School of Rubens, style of, manner of, attributed to etc. This is an area of picture buying best left to the adventurous, the specialists and to the speculator. One of the hazards of buying at auction is to unknowingly bid against an art ring. These are systems set up by a group of dealers that together agree privately not to bid against each other during an auction. Their action will lower the number of buyers bidding against each other, allowing the ring to win the sale at a lower price. Bidders outside a ring lose the chance to buy by the nature of the mechanism excluding them and sellers, equally, are damaged by receiving a much lower price. The subsequent knockout auction (where the ring bids in a public auction as a group and subsequently auction the work of art amongst themselves) is a technique that has been known in the London book trade since 1830. Auction houses dislike rings operating in their showrooms and the operators try to hide their presence by nominating an agent to act for them and in some cases he or she may even be unaware that they are acting on behalf of a ring. Auction rings are illegal and the original seller can claim against the group. In practice this rarely occurs given the difficulty of uncovering the existence of the operation. A useful way to secure a painting at auction is to ask an art dealer to bid for you, giving him a ceiling for the highest offer you want to make. By going this route you acquire the dealer’s experience besides your bid being anonymous to others. The dealer may have a fixed fee for providing the service or you can negotiate the honorarium. This way of bidding is the technique often adopted by prominent individuals or art museums that do not want to show their hand when buying an old master that may, for example, be a missing part of a work of art that is already in their collection. 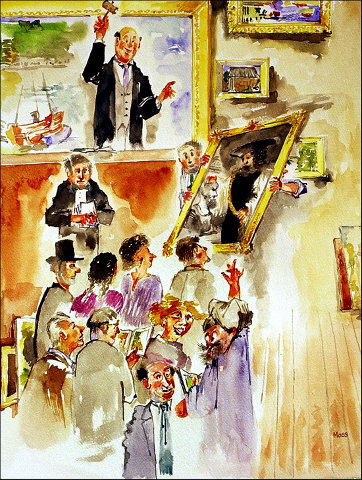 Remember, however, the auctioneer’s duty is towards the seller and both are united in their desire to get the best possible price. Similarly, a dealer acting as your commission agent may not be unhappy to see a ring bidding up a painting that you are interested in. The dealer may force the ring’s hand and compel them to raise their price as high as possible, his remuneration being based on the final figure reached. This is a situation that the auctioneer himself will be happy to encourage; it is to the advantage of the seller. Always indicate, clearly, to the person acting on your behalf, the price beyond which you will not bid. If you are a person who loves paintings and regards visiting art museums as a pleasure in itself rather than a duty or a necessary part of visiting a city, you will acquire without being aware of it an eye for good art and why previous generations bestowed on some artists the title of Old Masters. Go for quality when buying at auction no matter what is written in the catalogue or what the experts say, despite a paintings possible poor physical condition. You discover an old painting from the early nineteenth century or earlier at some local auction that has everything wrong with it, no frame, paint flaking off the surface, frayed at the sides where the sharp edges of the wooden stretcher (frame) has worn through the canvas, tears that have been patched up with old patches on the back and, generally, in a pitiful state, and, to make matters worse, unsigned and undated. On the other hand should it appear, under the dirt and grime and the smoke-blackened varnish to have been well painted and by a professional artist you may have the chance of picking it up for a modest price. One has little to lose. Your bid having been successful, a good paintings conservator will be your next port of call. He or she is a specialist in salvaging paintings in danger of being lost to humanity, the equivalent in the art field of the medical surgeon. The conservator will clean and restore your work of art, halt further flaking of the paint layer, reline the torn and aged canvas onto a new canvas backing and finally, by removing grime, old yellowed varnish and previous repairs on the paint surface will reveal hidden beneath, the beauties of the once concealed original colours and confirm the good quality of the work of art that you had only guessed at. Thus, for a modest investment, you have acquired a good and respectable Old Master. You can take the your adventure further, for the purpose of valuing your newly acquired investment or decide to undertake some research to try and discover the author of your painting. Take good quality small photograph of the painting with you on your travels in case you have the opportunity to visit art museums. You will be surprised at what you can discover in this manner such as paintings similar to your own. This will alert you to the period in which your painting was probably done, the school to which it belongs, possibly the studio in which it was painted and even better, perhaps the name of the artist. Getting to even one these stages in your investigations will produce a feeling of real satisfaction.